Digital Module Technologies offers a full Design and Development solutions. We deliver a web application that will allow you to provide a quality based information about your prospective or existing business to your web users. 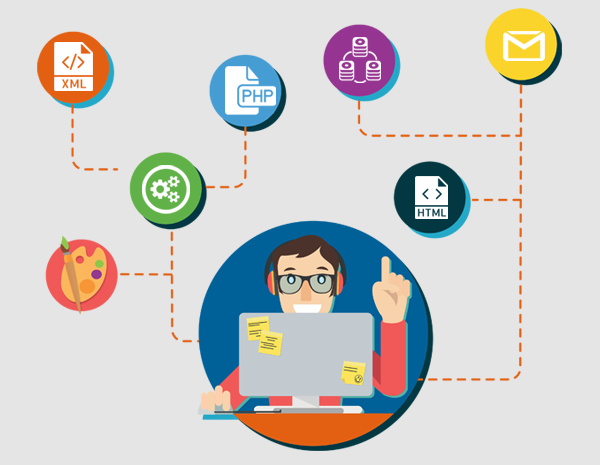 We develop these websites using latest and modern technologies like PHP and JAVA, with superlative and polished work force. We follow complete life cycle of a software development to ensure enduring performance. Our representative analyses your business type, requirements and information to be shared with web visitors and suggest you the right way forward. We strive to satisfy each of our clients. We maintain continuous contact with each client during development phase and if client suggests for any change/s, we readily accept, evaluate and put them immediately into action. Our team is highly talented and has many years of experience in the Web Development industry. Continuous education also ensures that our team stays updated with latest technologies. Combination of technical and business skills our team has accumulated over a period of time, enable us to deliver an end product of high standard based on your unique specifications and requirements. After the completion of your web Application, it will undergo a QA process which is deployed within our own server. We also provide Online Test Ride of your web Application. Once it is live, they get additional business through their online application resulting in best returns for their investments.